The Canadian dollar managed to gain on most of its major rivals today, excluding the US dollar, thanks to the better-than-expected inflation print released by Statistics Canada during the trading session. The Consumer Price Index rose 2.0% in December, year-over-year. Analysts were expecting the same 1.7% increase as in November. Month-on-month, the index rose 0.2% in December, seasonally adjusted, after falling 0.1% in November. The biggest contributor to the increase were airfares (+21.7%), offsetting the falling prices for energy products (-3.7%). It is important to remember that the jump in air travels was temporary due to the holiday season. Furthermore, due to the methodology change in the airfares category in the early 2018, year-on-year comparison will be rather unreliable in the near future. 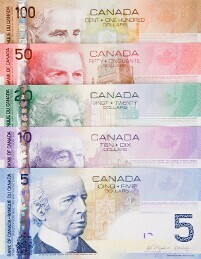 Rising oil prices also contributed to the strength of the Canadian dollar on Friday. The North American grade jumped more than 3% due to a range of factors, including hopes for improving Sino-US trade relationships and falling oil output from the Organization of Petroleum Exporting Countries. USD/CAD was little changed at 1.3271 as of 21:45 GMT today after falling to the daily low of 1.3231 earlier. EUR/CAD dropped from 1.5116 to 1.5080. CAD/JPY rose from 82.27 to 82.69.